Nespresso pod coffee machines can be thought of as the Rolls Royce equivalent in the world of convenience coffee. Quite expensive, yes, but reassuringly so. You just have to look at the smooth and sophisticated looking television adverts, with Hollywood stars like George Clooney. All very well dressed, relaxed and confident. These are the attributes that a Nespresso coffee tries to communicate to you. The pods for a Nespresso coffee machine are not usually available in regular supermarkets. This tends to add to the exclusive feel of the product. Customers can join the Nespresso club and order direct from the company. 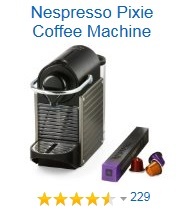 Alternatively, other online retailers stock a variety of Nespresso products for your enjoyment.